A nice example of a Sony CRF 230 receiver reached me, following the death of a distant relative who had previously owned it. When I started searching the web for information on this receiver, I quickly found several references to people looking for copies of the service manual, which was no longer available. As my receiver was accompanied by an original service manual, I decided to scan it in and make it available to others who might require a copy. Please note - the pages of the manual are "Letter" size (216 x 279mm); this means that they will not print out at full size on A4 (210 x 297mm) paper. The front cover of this service manual states that it relates to models with serial number 30001 and later. I do not have any information on differences from other versions of this model, nor on differences from the later CRF 230B. 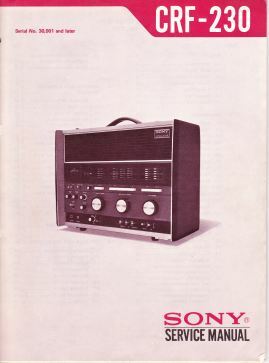 This receiver was produced by Sony in the 1970s. It is a real monster, weighing 14kg. It uses single conversion tuning on LW, MW, FM and SW-1 and double conversion (1st IF at 1.6 - 2.2 MHz and 2nd at 455 kHz) on the other 18 shortwave bands. It is not a full-coverage receiver, but is unusually sensitive for its vintage, with good quality audio. If you purchase one, try to obtain it with the four-pin power cord. Two pins are used for mains power input, the other two may be used for a DC supply. If you have to make up your own supply cord, be certain to use the correct pins!